It’s nearly the 2017 Morel & Sponge Mushroom season and we are just as excited as you are to begin seeing and sighting this annual beauties! This year we are taking a closer look at hunting mushrooms in season on private property vs. public state parks, reservoirs and nature preserves. Mushroom Hunting Laws, Rules & Regulations – Can I Hunt Mushrooms at State Parks and Reservoirs? The first rule of thumb is that mushroom hunting for personal enjoyment is almost always permitted on state park and state reservoir properties, and there are no license requirements or laws to do so. HOWEVER if you are hunting and picking sponge mushrooms (morels) or other mushrooms such as puffballs or “chicken of the woods” shelf mushrooms for sale or commercial use you are not allowed to pick or hunt mushrooms at a state park or reservoir. Mushroom hunting as well as wild berry-picking are some of the few activities that are fully exempt from licensing laws in Indiana, so it is OK to leave marked trails to look for morel mushrooms or other in season fungi in your favorite State Park or Reservoir! Some restrictions may apply in some seasons when hunting or other management activities are underway at reservoirs; check at the property office before you venture out. Restrictions may vary at state forest and state fish & wildlife areas. Always Contact the property office before you go afield. If you plan to mushroom hunt on private property, it is important to obtain landowner permission first. Plain and simple. Hunting morel, sponge mushrooms , puffballs, chicken of the woods and other species of mushrooms for personal/individual use and enjoyment is permitted on State Parks & Reservoirs. No license or permit required. It is ALWAYS ADVISABLE to check with the local office of the property first in case of special circumstances that may limit or prevent mushroom hunting under special circumstances. 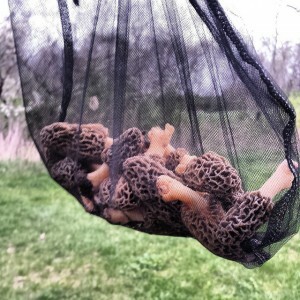 Hunting and picking morel mushrooms, sponge mushrooms, puffballs, chicken on a shelf or any other type of mushroom and selling them for commercial use or profit is NOT permitted at any State Park or State Forest. According to the DNR, it is OK to hunt mushrooms in season in Indiana and simply walk the woods. You are allowed to leave marked trails at State Parks and Reservoirs, just be careful out there! REMEMBER – some state forests may have their own rules, always contact the local office! When does mushroom season start in Indiana? Generally speaking, mid to late April is the start of mushroom hunting season in Indiana. We have found mushrooms as early as April 10th on some warmer spring seasons. If you are seeking sponge mushrooms AKA Morels, they often grow out of the ground when the temperature of the topsoil has reached about 55 degrees Fahrenheit – the season continues on through May and Mother’s Day and stop when the ground temperature has gotten above 60 – 63 degrees F.
Best of luck this year and as always, give me a call and let me know where you found that big mess of shrooms!